RoyalEnfields.com: What's it like to ride the 1962 Royal Enfield OHC prototype? 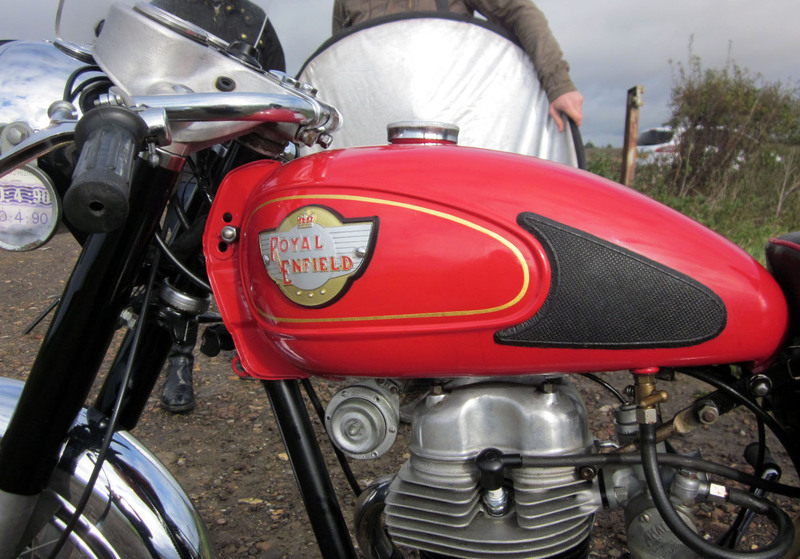 What's it like to ride the 1962 Royal Enfield OHC prototype? 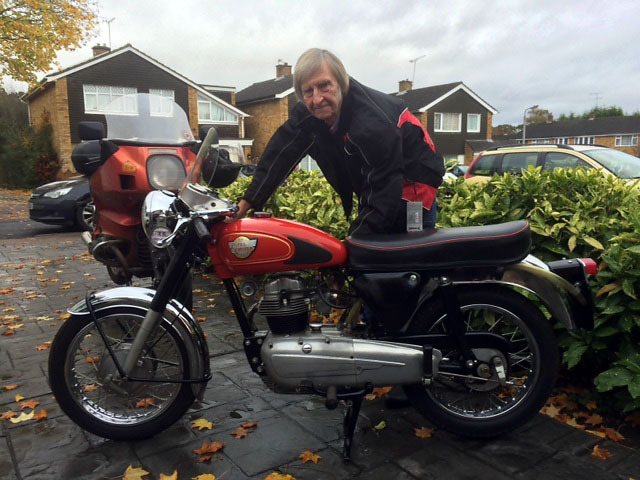 Justly proud new owner of the Royal Enfield OHC 175 prototype, Gordon Hallett. Royal Enfield enthusiast Mark Mumford recently got to examine and actually ride a very rare Royal Enfield that just changed hands at a Bonhams auction Oct. 15. The motorcycle is the 1962 Royal Enfield 175cc overhead-cam prototype. 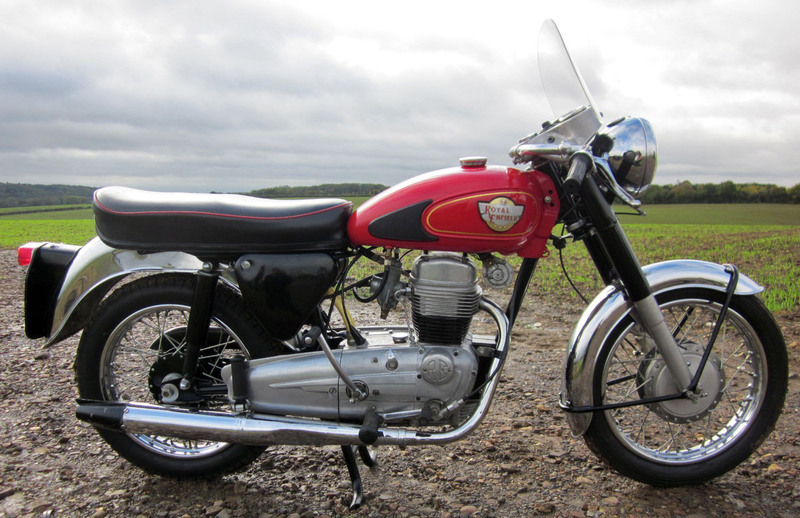 According to the auction website, this one-and-only example of what might have been was designed by Royal Enfield's Reg Thomas. The overhead camshaft motor reflected popular European motorcycles of the day, and its 175cc size would have entitled it to less costly insurance rates in the UK. Its size and overhead camshaft would have made it the most modern Royal Enfield to emerge from the company before it stopped production in the UK. So what happened? A 1989 magazine cover story referred to it as the "The Enfield Enigma." "Gordon Hallett, the new owner of the unique 175 OHC Royal Enfield very kindly invited me to ride the machine shortly after its purchase at the Stafford Classic Motorcycle Show Auction. This bike was in the public eye for some years, being a window display at L& D Motors in Bristol, L& D having acquired it and some other Enfield prototypes including an 800cc Series 3 Interceptor from the Westwood factory when Royal Enfield ceased production (in the UK) in 1970. "It was sold at auction when L&D closed and disappeared for a while; now in Gordon's ownership it will get plenty of exposure! The Royal Enfield OHC 175 is small; wheels are 16-inchers. "First impression is how small it is, partly explained by its 16-inch wheels but, even so, it is tiny. Once on board there is enough room for me at 5-feet 6-inches, but taller riders will struggle! "The initial appearance is Crusader but closer examination shows that only a few components were taken from the existing models. The frame is unlike the Crusader with a single lug attaching the rear of the engine to a vertical down tube and the front engine plates look like cut down 250 items clamping to the single front down tube. Rear down tube anchors back of motor and the swing arm. "The front forks appear to be Crusader items with a 6-inch front brake from the Clipper range, probably chosen because the larger 7-inch hub fitted to the 250s would leave very little spoke length on 16-inch wheels. Front brake is small, perhaps so it looks "right" on the small wheel. "The top yoke is the Continental type with twin 'small' (2-inch) magnetic instruments, the drive for the tacho being taken (unusually) right from the bottom of the engine, presumably being driven from the crank. Tiny instruments for young eyes and ace bars for young backs. "Ace bars are fitted. The saddle is an unknown item and the toolboxes are from a 150cc Prince two-stroke. "The front mudguard is the pattern used on the Crusader Sports but must have been specially made as it follows the curve of the 16-inch wheel perfectly. 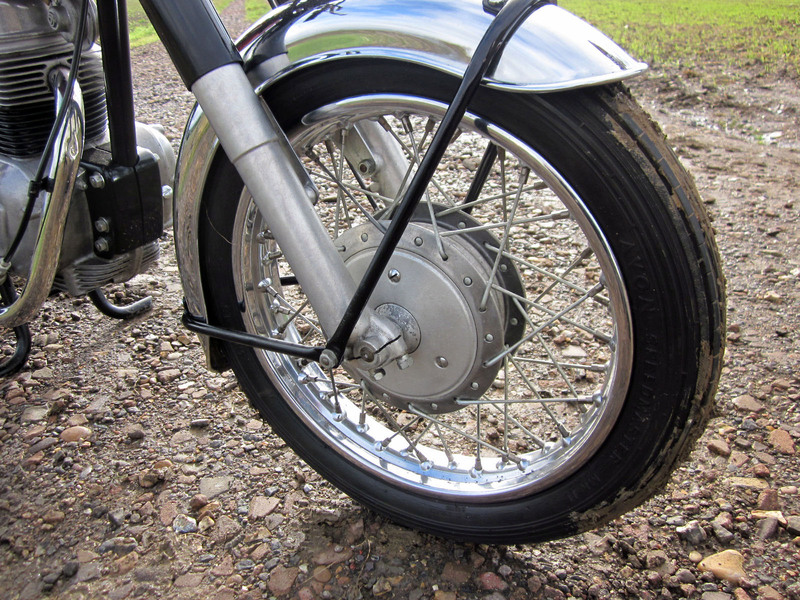 The rear mudguard is a Crusader item that has been cut and welded to fit. Unusual quick detach rear wheel, but clamshell adjusters are familiar. 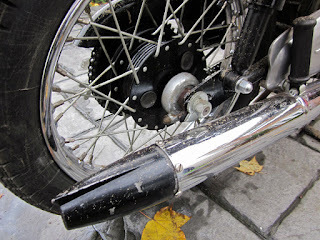 "The rear wheel resembles an Enfield item but has bung holes on the off (right) side that apparently give access to three bolts making the rear wheel Quick-Detach, but not in the usual Enfield way for the time. Interceptor tank adds to the sleek look of this tidy little motorcycle. 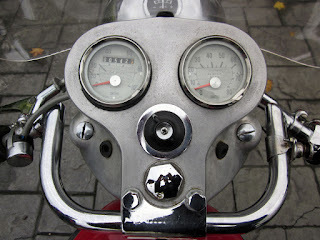 "The tank is a 2.5-gallon item from a U.S. export Mark 1 Interceptor, the giveaway being that it has twin petrol taps. There is a raised ridge on the tank sides, which usually contains a chromed panel, but is filled by the usual Royal Enfield tank badges. The tank is finished in a warm russet colour, not one I recognize from standard Enfield models, finished off by a unique hand painted '175 OHC' logo. A Royal Enfield logo you've probably never seen before. "The 'wings' continuing the sweep of the crankcases towards the rear wheel are actually two separate alloy castings screwed to the frame. They are purely a styling exercise with no practical function at all. 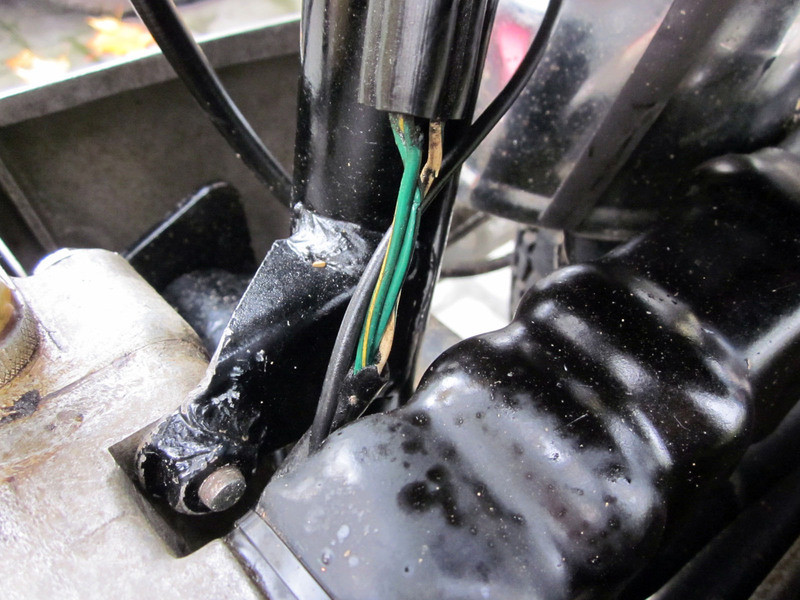 If anything they interfere with the operation of the brake pedal (which has been trimmed to fit) and push the brake light switch out into the open. These sort of details would surely have been tidied if the bike was ever produced. Streamlined "wings" carry the lines of the crankcase rearward but have no real function. Chain inside a tunnel cast into this side of the cylinder barrel operates the single overhead cam. Small pointer on the side of the gearbox indicates the five-speed is in Neutral. 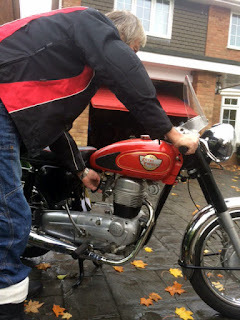 "The ignition switch is mounted under the saddle on the right and starting is easy after tickling the carb. As it stands the carb, a one-inch Monobloc, is not fitted with a choke so starting from cold needs a hand over the bell mouth. Gordon intends to fix this soon! Gearchange on the very slick five-speed box is normal right side pattern via a standard Crusader lever with a cut down Crusader brake pedal on the left. 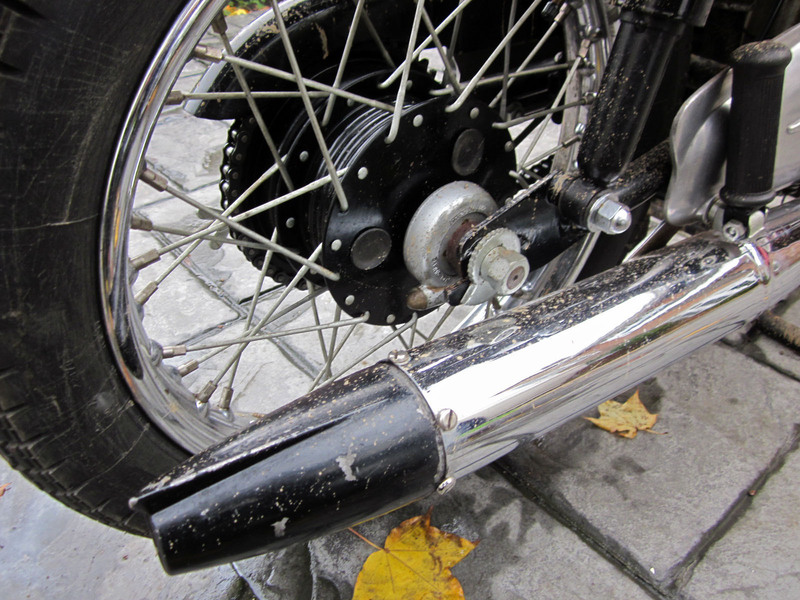 The exhaust is a period two-piece item that was fitted to the Enfield range from 1961 to '63 although the alloy tail cone has been modified to bolt on rather than through as standard, possibly for freer breathing as it is quite loud! Starting up: no clatter of push rods. "The absence of the characteristic pushrod clatter of the Crusaders is very noticeable; although the motor is not mechanically silent it is very quiet with a distinct whine of cam drive. "Pulling away first gear feels quite tall and needs considerable revs before getting into second. After that the gears are nicely spaced with no obvious gaps all the way to fifth. The gear change is smooth with very little pedal travel needed and positive engagement every time. The speedo shows that you are doing 40 mph by the time you get to fifth gear but the tacho confirms that there is little usable power below 4,000 rpm although the engine spins up freely with little flywheel effect. "In deference to the low indicated mileage I didn't rev the engine too hard so top speed would have to be a guess but I'd think that 80-plus might be possible if the motor is capable of revving out fully. "Handling is excellent: extremely taut and precise with comfortable springing at the rear although the fork springs, probably standard Crusader items intended for a heavier machine, are a little too hard. A fresh, modern concept from Royal Enfield: 55 years ago. "The big questions are would it have sold, and would it have made a difference to Royal Enfield? I think the answers are no, and yes but perhaps not in the obvious way. "I can't imagine that the price-conscious youth market would be prepared to find the extra money that this machine would undoubtedly have cost. Enfields were already more expensive than their competitors and in this version at least, the 175 would have demanded many new components and probably extra expensive assembly time. "And as the owner of a 1966 Continental GT I can compare the two and say that the GT would probably see off the 175 in a real road situation, even if not by much. However, from the point of view of mechanical noise, the OHC easily wins over the clattery GT! "The second point is more complicated; thinking about what this bike represents in design terms is probably the key. It's novelty and mechanical complexity are bold statements from a small design team working in a small, busy factory who were selling everything they could make and still finding time to develop a 250 two-stroke Grand Prix bike, competitive scramblers, a range of unit construction road bikes, prototype commuter machines, big traditional (but improved) twins and much more. "At one time there was also a 200cc engine as well as the 175cc prototype. 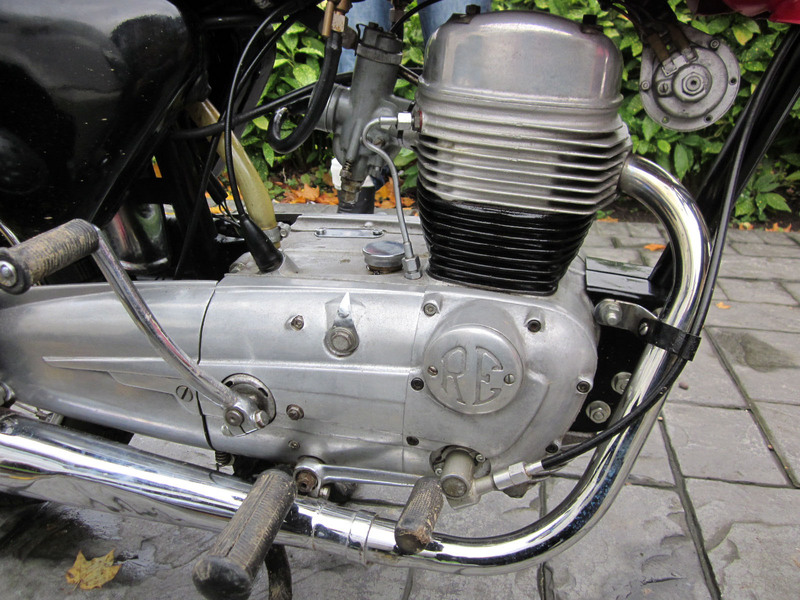 This engine, identical in appearance, was not numbered and appears never to have been built into a complete motorcycle. It was briefly featured in The Gun magazine with an appeal for parts to complete but no more seems to have been heard. 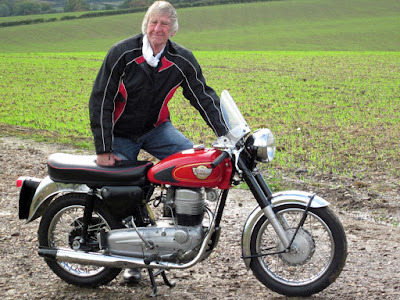 "Gordon has managed to talk to the restorer who put the then incomplete 175 back on the road in 1989 who confirmed that at that time the bike was accompanied by a 'tea chest and a half'' of spares including several sets of crankcases, machined and unmachined (but not numbered), pistons in various compression ratios and several crankshafts. "He confirms that the cranks were built with a one piece rod and floating bush like a Bullet, not a split rod with bearing shells like a Crusader. "I was struck again by the activity Enfield were putting into this sector, the 75 and 90cc two-stroke prototypes, the 175/200 OHC, the existing Crusader range including the 350 and the Villiers powered Turbo Twin, the GP5 racer and Starmaker scrambler (moto-crosser) — altogether a serious attempt to address this important market sector just as the Japanese were doing. "It is almost as if they were saying to their Board, look what we can do and where we can go, let's go for it. Sadly this optimistic period was not to last and changes in ownership soon saw the company retrenching production and cutting back on development. The rest, and this wonderful little bike, is history." Nifty article about a nice survivor bike. I wonder if the new RE twin(s) will incorporate any of this bike's styling.